We often write about church pews for smaller churches across the country but we also install church pews in large churches. There are big differences between small churches and big churches, however, in terms of what they need for church furniture. Since we have experience doing both, we can help your church adapt small church tactics for a big church setting. A lot of church goers are intimidated by large churches that have hundreds of members and multiple church services to serve them all. If you grew up in a small community church with faces that you not only recognize but know very well, a large church can be overwhelming. Seating arrangements can make a big church feel a lot smaller and more intimate. 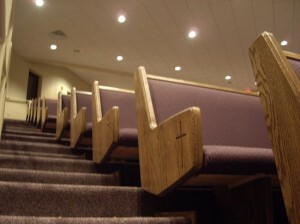 There are usually two options for big churches when it comes to levels of seating. Some big churches opt for sloped church seating that allows everyone to see the altar and speakers while other churches opt for traditional flat seating and use technology like speakers and monitors to allow for church goers to see what’s going on at the front of the church. The traditional setup where there isn’t much slope can give a familiar feel to people accustomed to smaller churches, as if someone expanded their idea of a church’s interior two or three times. Being on the same level as other congregation members gives a feel of church members being on equal footing. However, using monitors and speakers to relay image and sounds can make some churchgoers feel as though they’re in a theater rather than in a church. Sloped and stadium style seating can help bring people closer to the action at the front of the church and help them feel more included because they can see more. The non-traditional layout can enable you to pack in more congregation members for big Sunday services so if space is a concern, this style of seating is usually a better choice. However for church goers who have only ever attended small church services, the contemporary nature of the seating can make them feel like they’re at a concert or sporting event instead of at church services. Determining which layout works better for your congregation comes down to what you think works better for your church services and what your congregation will best respond to in terms of feeling comfortable in the church space.